If right-wing parties run separately, 17 mandates could be lost. Labor also in danger of failing to cross threshold. Otzma tops Jewish Home. The Israeli right could potentially win this year’s Knesset election and still lose power, a new poll released Friday morning shows. According to the survey, conducted by the Maagar Mohot polling firm on behalf of Israel Hayom and i24NEWS, current coalition partners in the Likud-led government, along with other right-wing factions, could cost the right-wing and religious bloc a total of 17 mandates if no new alliances are formed. To enter the Knesset, a party list must get at least 3.25% of all valid votes, or approximately 140,000 to 145,000, given projections of likely voter turnout. Any party which fails to receive more than 3.25% of the vote is denied representation in the Knesset – even if it received enough votes for one, two, or even three seats. In 2015, a joint list of the Yahad party, led by former Interior Minister Eli Yishai, and the right-wing Otzma Yehudit party, narrowly failed to cross the threshold, receiving 2.97% of the vote. The new Maagar Mohot poll shows a large number of parties which currently enjoy Knesset representation failing to cross the threshold. If new elections were held today, the Likud would remain the largest faction, with 29 seats, followed by former IDF Chief of Staff Benny Gantz’s Israel Resilience Party with 17. Yesh Atid comes in a distant third with 11 seats, followed by the predominantly Arab Joint List with 9 mandates. Both the New Right, led by Naftali Bennett, and the United Torah Judaism party would receive seven seats, while the far-left Meretz would rise from five seats to six. Shas would fall from seven to just five seats, its poorest showing in decades. The Labor party, which has declined steadily in the polls over the past year, would barely cross the threshold, winning just four seats. In 2015, a joint list of Labor and the smaller Hatnuah faction won 24 seats. Today, Hatnuah is projected to win enough votes for a single seat – but would fail to cross the threshold. In addition, the Arab nationalist faction Ta’al, led by former Arafat adviser MK Ahmed Tibi, would narrowly fail to clear the threshold, receiving votes equivalent to three seats. The right and center-right would suffer greater net losses from parties failing to cross the electoral threshold, however. Finance Minister Moshe Kahlon’s Kulanu party, which won 10 seats in 2015, would plummet to just 3 if new elections were held today – and fail to cross the threshold. In addition, former Defense Minister Avidgor Liberman’s Yisrael Beytenu party, which won six seats in 2015, would fall to just three mandates, and also fail to cross the threshold. If the Jewish Home and National Union lists, which ran together in 2013 and 2015, fail to reach an agreement for a joint run, each faction would receive enough votes for just two seats apiece – and fail to enter the Knesset. 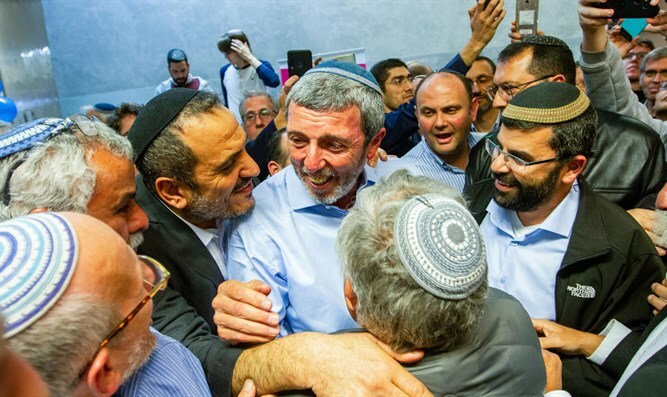 The right-wing Otzma Yehudit, led by former Kach party activists Michael Ben-Ari and Baruch Marzel, would receive enough votes for three seats, but fail to cross the threshold, while Eli Yishai’s Yahad would receive votes equivalent to two seats. Moshe Feiglin’s Zehut would also receive enough votes for two seats. In total, the right-wing and religious bloc would win the 64 seats, including those parties which fail to cross the threshold. A total of 17 of those mandates would go to parties which fail to cross the threshold, however, compared to just 4 mandates going to left-wing or Arab factions which fail to cross the threshold. Votes for parties which fail to cross the threshold are divided up among the factions which do cross the threshold, in proportion to their overall share of the vote, thus benefitting larger factions more. With the second and third largest parties being Israel Resilience and Yesh Atid, the right-wing would likely lose its majority in the Knesset – despite receiving the majority of the vote.